Thrift Store Jewelry Cabinet Rescue! Hi thrifty makeover lovers! (I really need a new name for my fans… got any ideas?) 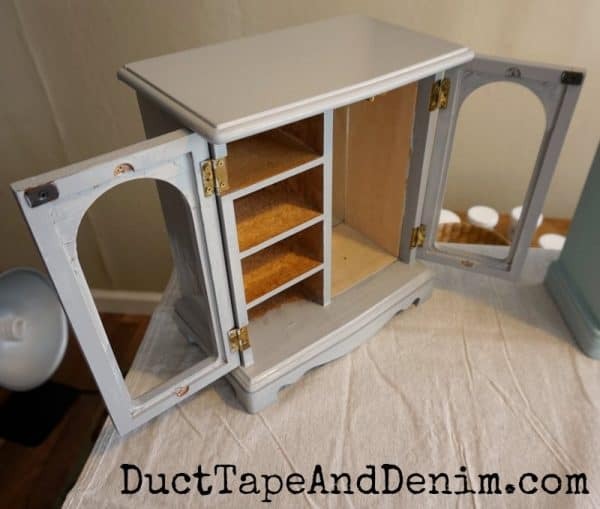 Today I’m bringing you another thrift store jewelry cabinet makeover. I bought this one last fall at Goodwill for $7.99. It’s one that was sitting in my closet all winter because I was too busy making Christmas ornaments for my Etsy shop to get any painting done. Other than that nasty “stained glass” it wasn’t in bad condition. First, remove the glass. Sometimes I also remove the handles but these were all very sturdy so I just left them in. I usually take out the drawers and paint them first. 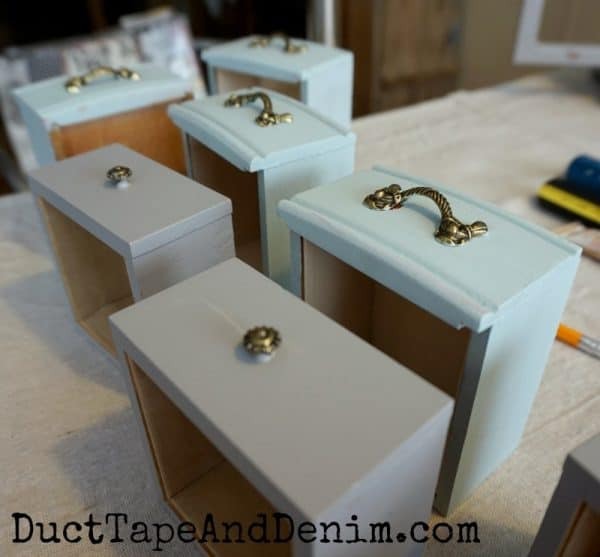 (You’ll see the blue jewelry cabinet in another upcoming project post — loved those handles!!) Then I turn the whole cabinet over and start painting it upside down. After two coats of paint, I let it dry completely and add a coat of varnish to seal it. While that dries I’ll cut the metal sheet to fit. HINT: Use the original glass as a pattern to trace on the metal with a Sharpie. When everything was completely dry I cut the scrapbook papers to fit the sides of the drawers. I painted on a thin coat of decoupage medium, stuck on the paper, and added another thin coat over it. 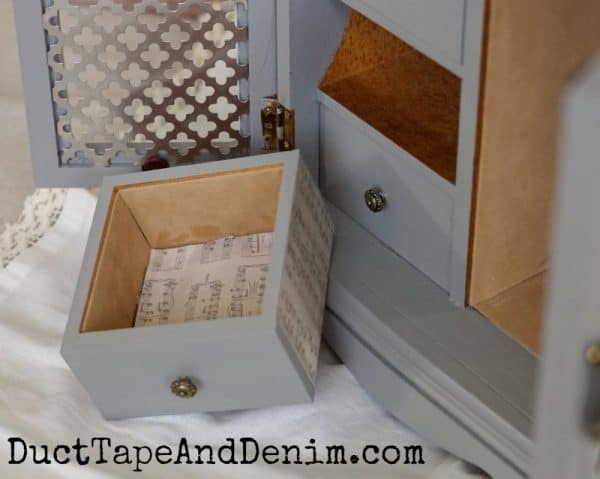 A couple of the drawers were stained inside so I covered them with scrapbook paper, too. Makeover stats: Bought at Goodwill for $7.99. Planning to sell at Paris Flea Market. Will update with price when it sells. Beautiful! 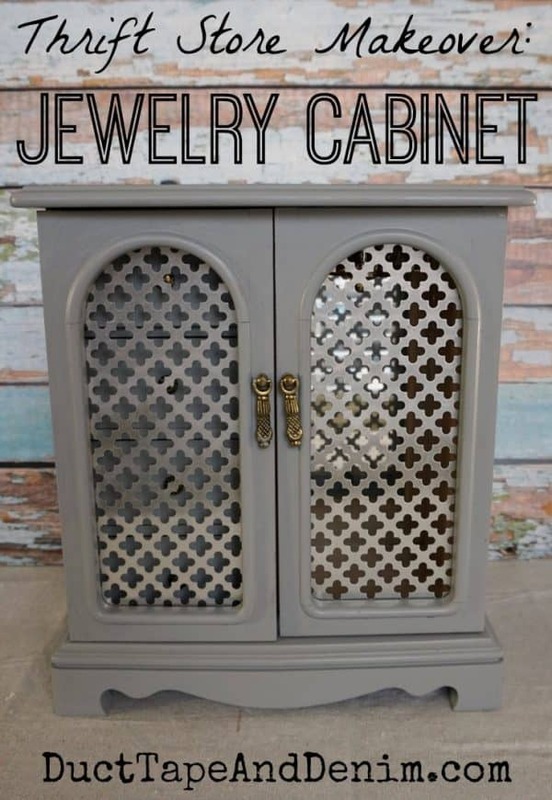 I just love these jewelry cabinets! This is a great remake. I like your refinish much better than the original. Thanks for sharing at What’d You Do This Weekend? Hope to see you next week. Super job on this makeover! Thanks for the idea about using the metal lattice. It looks adorable. 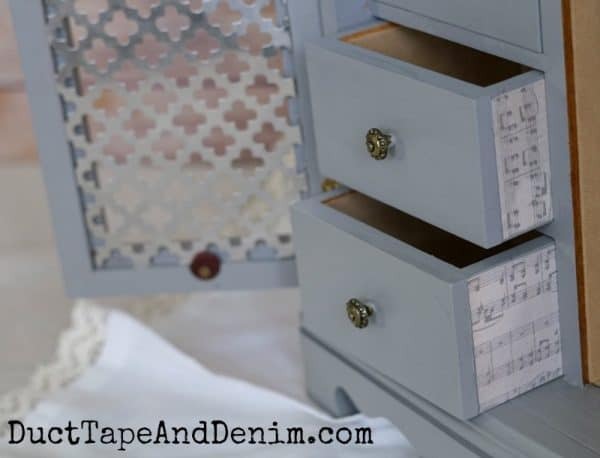 I also love the detail that you included in covering the drawers with the music scrapbook paper. It always amazes me how some people have an eye for seeing a treasure in something I would have mistakenly walked past. It is so cool to see how you transformed this piece. Love the transformation! I purchased a similar one at a Goodwill last year, I must pull it out of stash and give it new life. Thank you so much for the inspiration. Yes, Mary Louise, do it!!! I’d love to see a picture when you’re done. Very cool! I love the music notes on the side! this was such an amazing project and I thought it was so fun for you to share on Oh my Heartsie Girls WW. Im sure others thought so as well! Hope to see you later today with another fun idea. What a great makeover. Thanks for hosting and I hope you are have a great week. 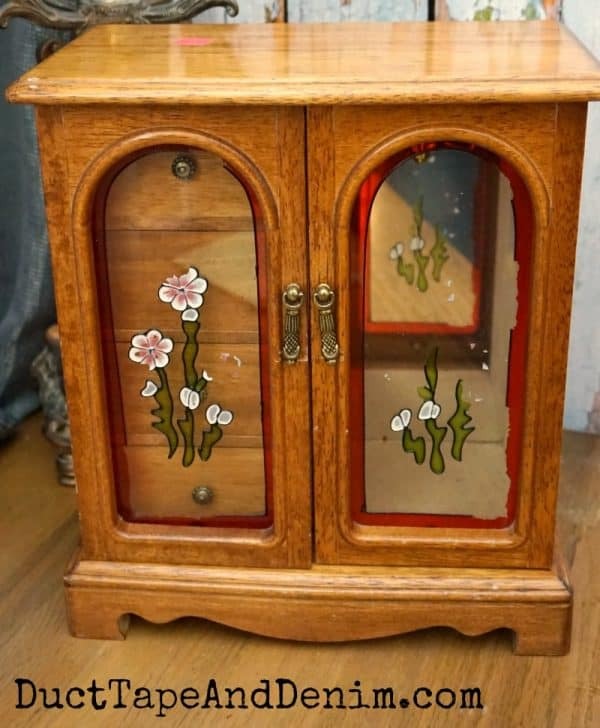 Great makeover, I have an old jewellery box that could do with a new look, I’m inspired – thanks. Love your make over! Thanks for sharing at the Inspiration Spotlight party. Pinned & shared. Love the grey and the metal sheeting is awesome in it! Great makeover! Thank you for sharing on Merry Monday! Hope to see ya next week! Looks much better! I pinned this! Thanks for sharing at the To Grandma’s House We Go DIY, Crafts, Recipes and More link party. Hope to see you again next week.